So the women in my family are very opinionated, and we tend to get what we want. Restaurants, family outings, vacations…they're all usually picked by my mom and me. I mean, I can't help it that we have good taste for one, or that my dad and brother hardly bother to speak up (err, yell) overtop of us to get their opinions known. Since I've moved home, I've been cooking a lot of trendy, but sometimes crazy and out there things, and my dad just so happens to be a meat and potatoes kind of guy.? As much as I joke around, out of everyone in my family my dad is absolutely the most selfless. He washes all the dishes after my mom and I are done cooking, and he rubs my mom's feet every night. He puts up with our crazy antics and lets us take over the TV…you get the picture. One of the things he really loves in life besides making us happy though is Chicken Parmesan. So, being the good daughter that I am, I decided to give him a break and do a spin on one of his favourites, and this One Skillet Chicken Parmesan was born. 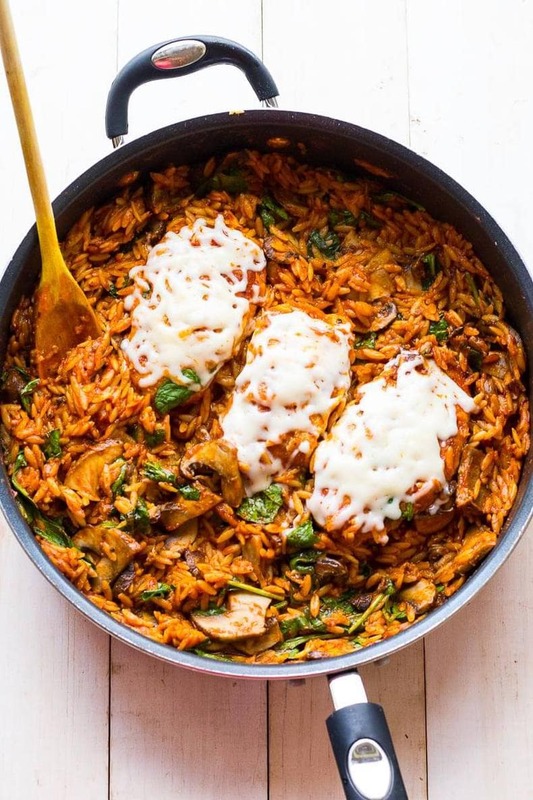 This One Skillet Chicken Parmesan is a fast and satisfying one pot meal filled with orzo pasta, spinach and portobello mushrooms for a healthy twist on a traditional favourite. You know me, I've gotta get my veggies in any time I have the chance!? Just look at this big pot of deliciousness right here. 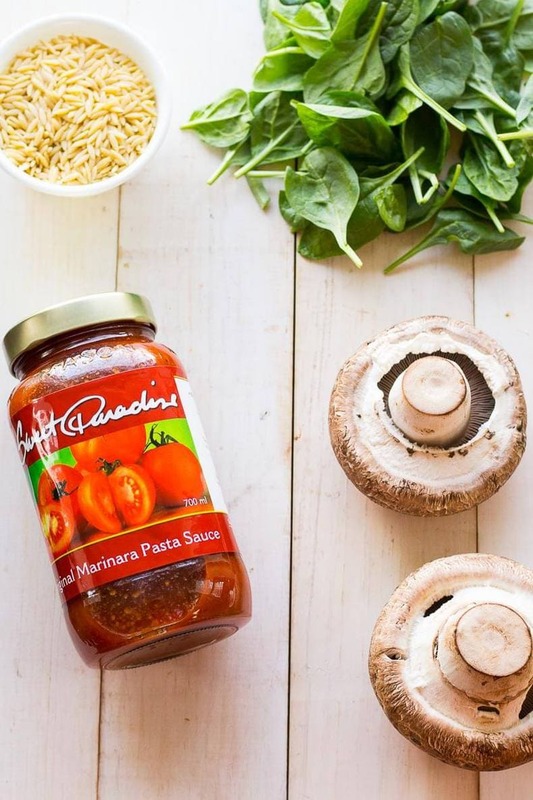 I lightly breaded the chicken in this recipe and as long as you follow my recipe, it will all stay in tact and become absolutely amazing and tender from cooking in the tomato sauce for 25 minutes. I seriously can't even tell you how much I love this recipe. Ready in 30 minutes and filled with all four food groups to perfection. 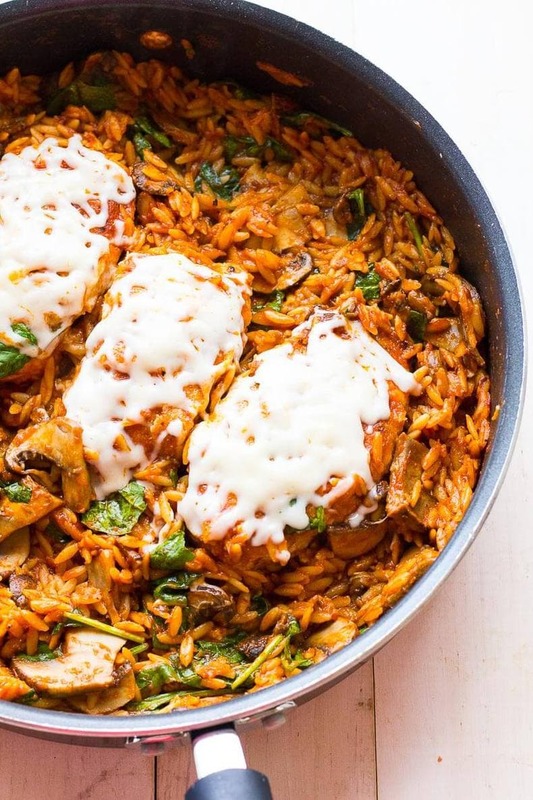 This One Skillet Chicken Parmesan will definitely become a new staple in your weeknight dinner routine. You're welcome!? 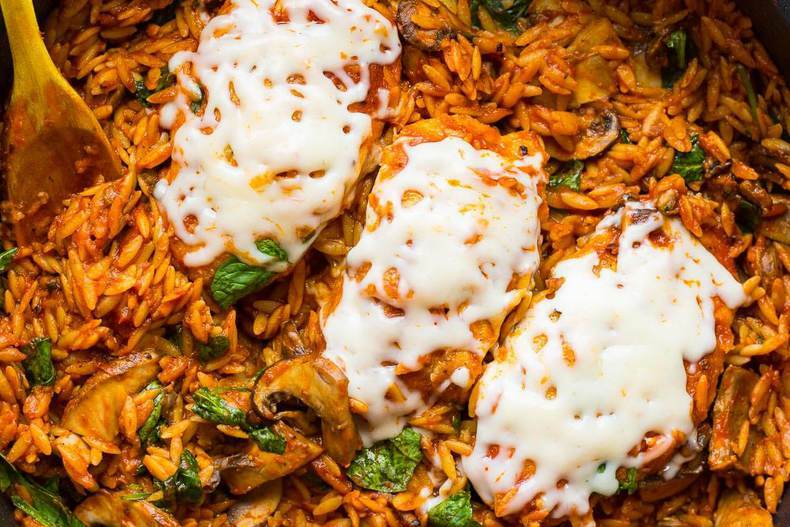 Will you be trying this One Skillet Chicken Parmesan? What are your healthy lunch routines? If you try any of my recipes be sure to let me know on Instagram, Twitter or Facebook – I’d love to hear from you!? 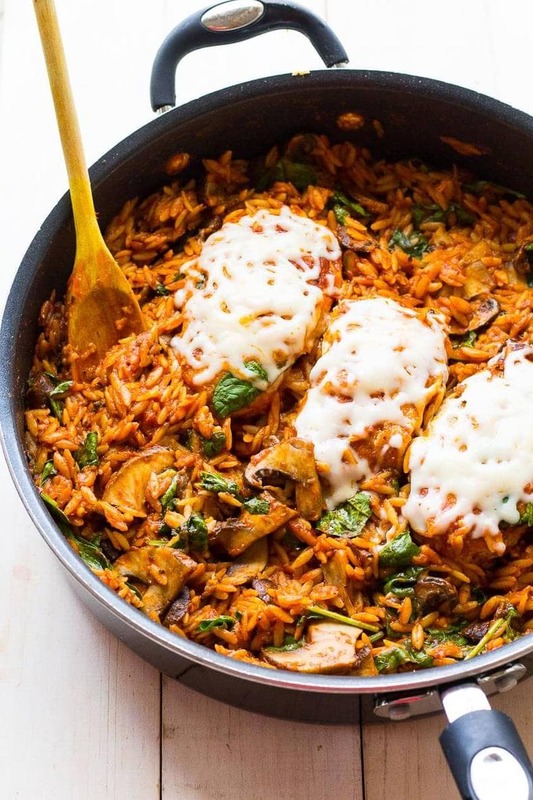 This One Skillet Chicken Parmesan is a fast and satisfying one pot meal filled with orzo pasta & spinach for a healthy twist on a traditional favourite. Heat olive oil in a large skillet over medium heat. Meanwhile, coat each chicken breast in egg, then in flour, then in breadcrumbs. Sprinkle with salt & pepper, then place in skillet and fry for about 3-4 minutes per side. When breading becomes a bit more solid, continue to fry chicken in the middle of the pan and add garlic and mushrooms around, sautéing for about 5 min. Add water, tomato sauce and orzo, then bring to a boil. 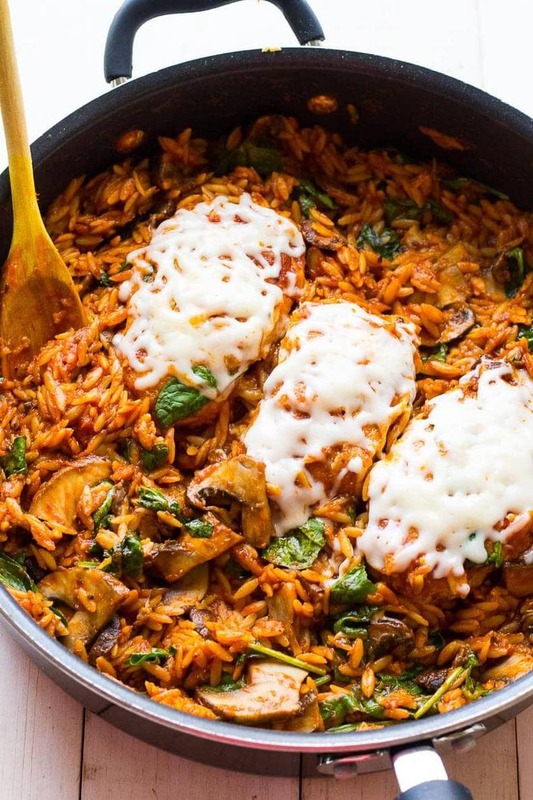 Lower heat to low-medium, then cover skillet with well-fitting lid and let simmer for about 12-15 min, checking and stirring often until orzo and chicken is completely cooked through. Remove lid and add cheese to the tops of each chicken breast. Stir in spinach and cover with lid again, cooking for another 2 minutes. One serving is about 1/2 a chicken breast and 1 cup of the orzo/mushroom/spinach mixture, and reheats fairly well on the stovetop. This looks delicious! So many of the ingredients are my favourite, it will make the perfect mid week dinner. Thanks for sharing. ? This looks so good, making me hungry. Love skillet meals. Thanks Candy! Skillet meals are my fave too! I must try this! Thank you! This seems simple and looks good! thanks for sharing! Yum! I’ll have to try this. Thanks for sharing! Looks absolutely delicious and easy to execute, thank you! Thanks Loren! I usually love orzo in Greek salads but this was a cool twist! Luxury lunch or dinner! I love this food 🙂 Pinned with pleasure! That;s great your dad does the dishes!! I wish someone could do mine! Hehe. Your chicken looks amazing! Anything with cheese is great in my book! Mm! 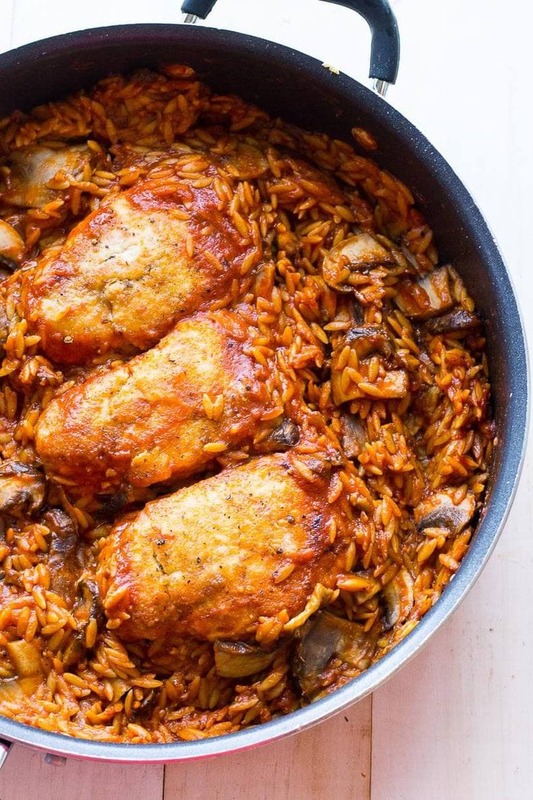 I love chicken parm, and I love one pan meals! Thanks for this! Yummo! Can’t wait to try this! OMG! This looks so delicious!! Must try! thanks for sharing! This looks amazing! I feel like chicken tonight, chicken tonight! Remember that silly little jingle? I don’t remember the company it was for, but man is it stuck in my head! Hahaha surprisingly I do remember that jingle! 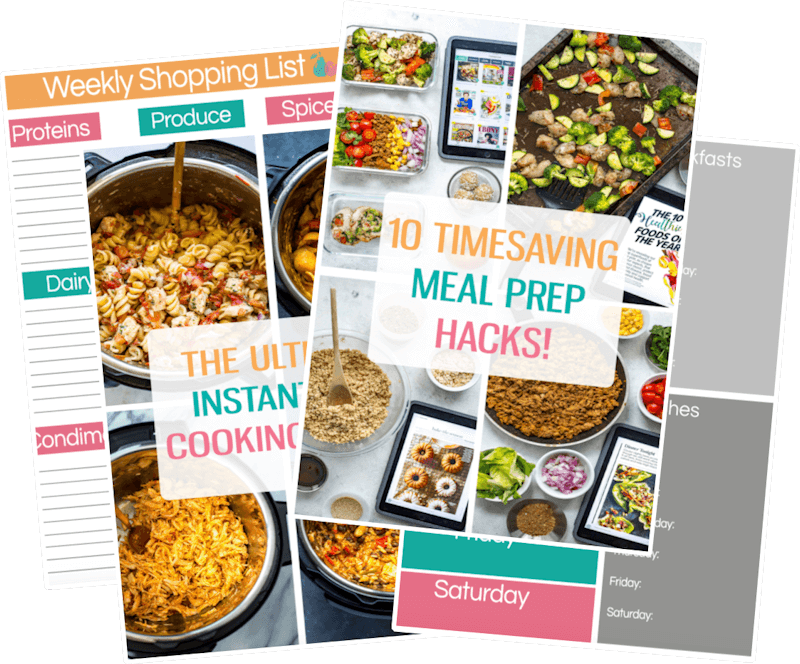 One pan dishes are so amazing on weeknights when I just can’t handle all of those dishes! 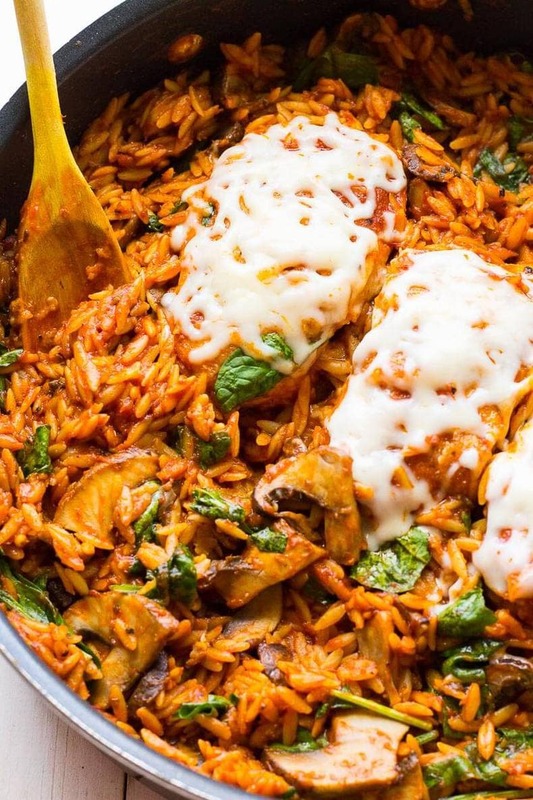 I love a good one pot receive – and with lots of cheese even more so!! 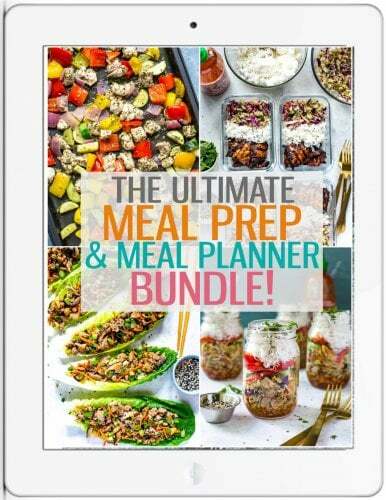 This looks amazing and super easy to prepare!! Thanks for sharing!! Do you chop the mushrooms or leave whole? Hey Shannon! I slice the mushrooms – hope that helps!